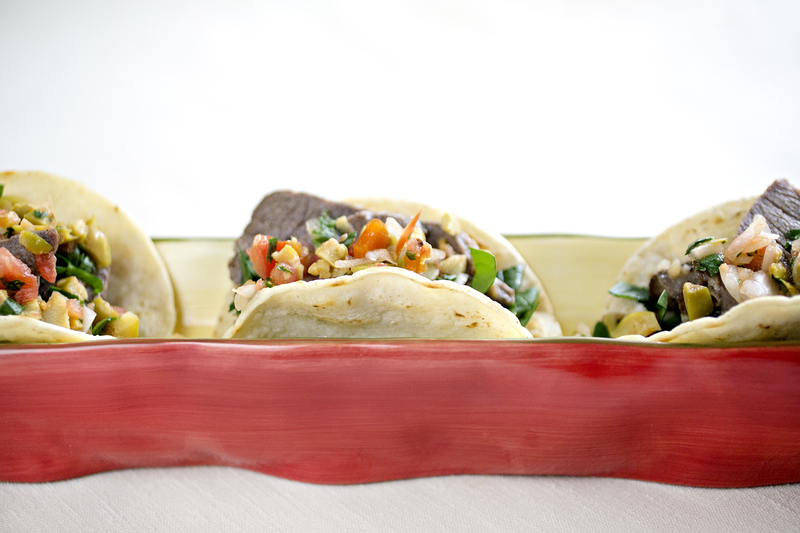 Tiny tacos + Spanish flavors = taco tapas! This is one of those simple recipes that I came up with in a pinch because I had no idea what to make and I was down to the final hour on cooking day. Oftentimes, those last-minute, seat-of-your-pants, on-the-fly creations end up being some of the best. The idea was simple. I took the broil-then-marinate steak approach that I really like to do with salads, made the marinade with classically Spanish ingredients (lemon, really good olive oil, garlic) and topped it with my dad’s famous Spanish “salsa,” a little Manchego and bada-bing: awesomeness in my mouth. The star player here is actually less the meat and more the salsa. It’s basically pico de gallo, but with olives instead of jalapeño. The result is sort of like a loose and very fresh tapanade. You can eat it by itself with chips or throw it on top of just about anything that olives will go with (crostini, salad, it would probably even be good on a flatbread pizza). If you can’t find the small “street taco” tortillas you can certainly use regular sized ones. I personally prefer the smaller bite, because between the meat and the olives it’s a pretty rich little morsel of goodness. Having said that, I think put back about four of these suckers. The nice thing about this recipe is that since you broil the meat, then marinade, you can cook ahead of time and throw them together at the last minute before a party or having people over. Obviously throwing some shredded spinach in there isn’t really necessary, and is mostly my attempt to put something a little green in to lighten and brighten the dish. I would stick with spinach over something like a spring mix, though, because spinach is stout enough to hold up to the other flavors going on. Season the steak (or steaks) with salt and pepper. Set your oven to broil, and broil on a foil-lined baking sheet to desired doneness (14-16 minutes for medium rare), turning half way through. Set aside and let rest for 5 minutes, then slice. Toss with olive oil, garlic and lemon zest and juice and let marinade for at least an hour (4+ hours or overnight is recommended, but not necessary). Finely chop all the ingredients, season with salt and pepper, and toss together. This can be done with a food processor or salsa maker. Heat a pan over medium and add the oil. Lightly fry each tortilla (about 2 minutes per side, until slightly crispy but still pliable) and remove to a plate or platter. Fill each tortilla with a little spinach, a few slices of meat, and top with the Spanish salsa and cheese. Vegetarian substitution: You could definitely go with some sautéed veggies here, or make the cheese the star player by using a thick slice. You could even try a milder spanish cheese, like drunken goat or Iberico.